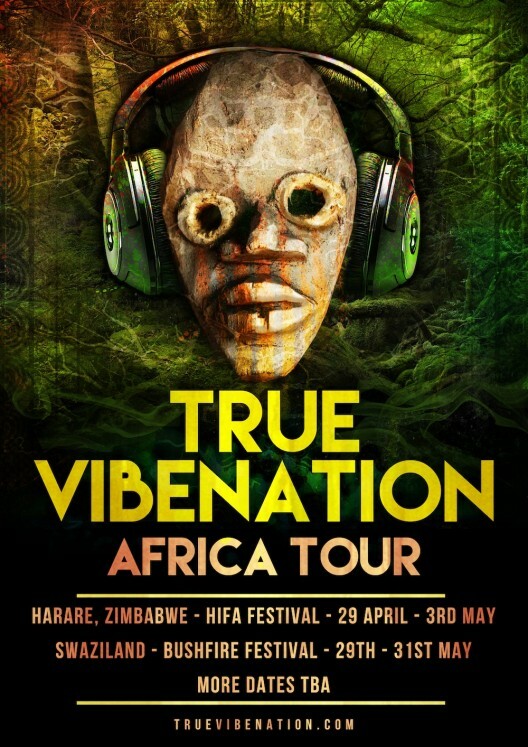 Horn playing hip hop/ producer trio True Vibenation announce a tour of Africa with appearances at HIFA and Bushfire Festivals on the famed Firefest route. After carving a path in the Australian music scene with a bold voice and universal message they prepare to take their infectious live show to the rest of the world. The trip is significant not only as the band’s first international tour but marks a return to the birthplace of members Verbaleyes and Native Wit where they will kicking off the tour at HIFA Festival, Zimbabwe before continuing south for more shows in South Africa and Swaziland. ‘Normally with our shows we feel like we bring a bit of Africa to Australia but with this tour we’ll be bringing a bit of Australia to Africa.’ Says Verbaleyes. With main stage slots alongside international legends such as Salif Keita and Les Nubians the Australian trio are set to burst on to the African scene with their brand of electronic beats, live horns and deft lyrics. 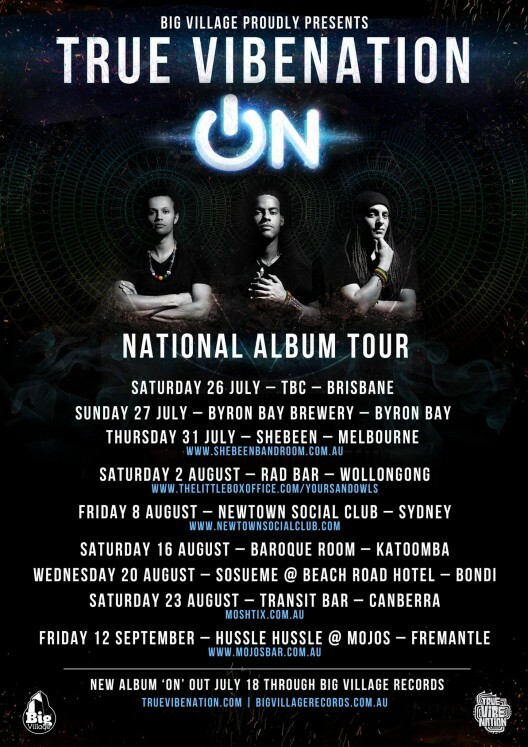 Since the release of their sophomore album ‘ON’ through Big Village nine months ago True Vibenation have been hitting the touring circuit hard with a live show that delights in sending the audience in to a wild frenzy. 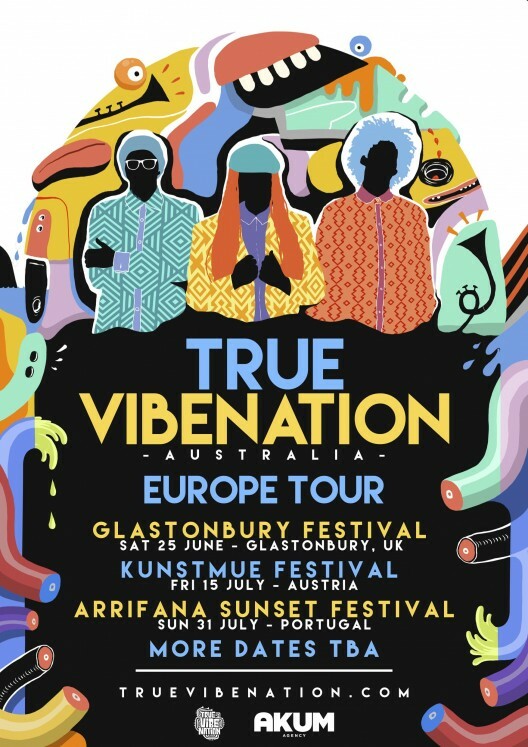 With another Australia tour planned for their return and multiple new projects on the way True Vibenation are keeping their noses to the grindstone in 2015. 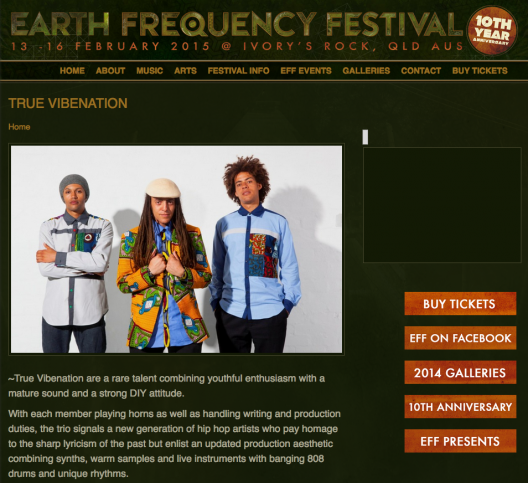 True Vibenation have been added to Earth Frequency Festival’s biggest line-up yet. 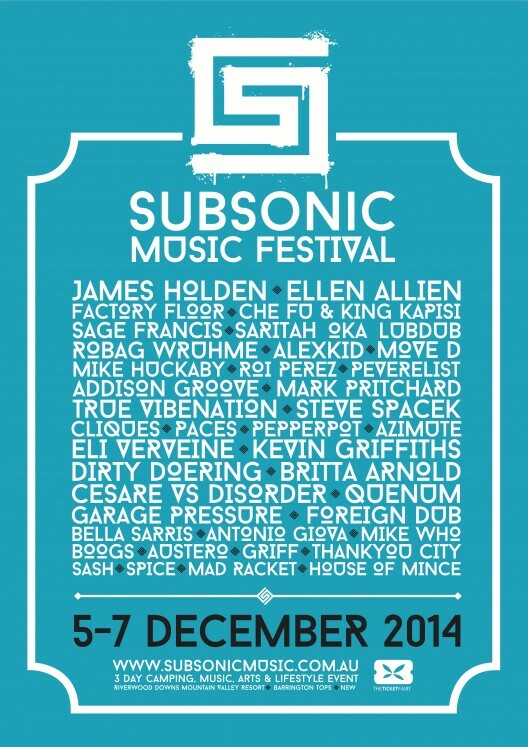 True Vibenation will be at Subsonic Music festival on December 6th. 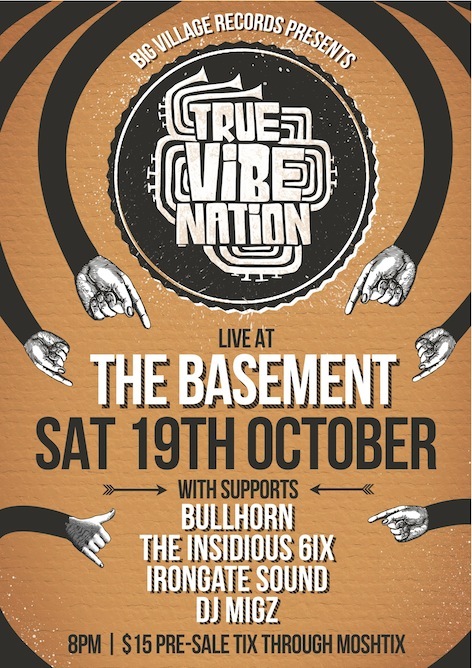 Sydney hip hop rising stars, True Vibenation take over iconic venue The Basement for one special night. Roaring live horns have always been a big part of True Vibenation’s sound and combined with supports from Brisbane’s 9-piece brass band Bullhorn, who are touring their new single ‘Roll Off The Top’, the high energy sounds of Insidious 6ix, Sydney dancehall dons Iron Gate Sound, and champion turntablist Dj Migz, the stage is set for a cracker of an evening. True Vibenation has had their nose to the grindstone all year and are showing no signs of slowing down. After recording their Standby Project early in 2013 the trio took to the road, releasing the project by concreting USBs loaded with music into walls across the country while on tour. After completing the ambitious guerrilla art/music project True Vibenation were straight back at it and before the concrete had even dried on the USBs they returned to the studio to work on the follow-up to their first album ‘The Sunshower Phenomenon’, released through Big Village Records in October 2011. ‘The Sunshower Phenomenon’ showed a young group pushing the limits of popular music to create a sound that is fresh, honest and uniquely theirs. 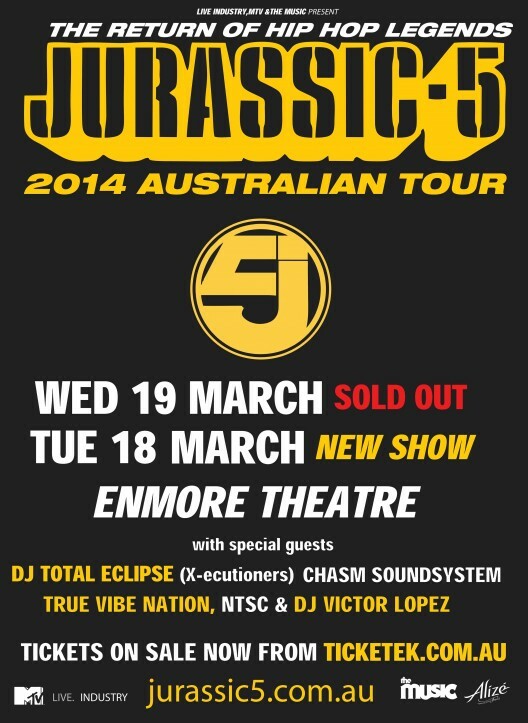 The album was named as the Triple J Hip Hop show’s ‘Album of the Week’ and snapped up for rotation. 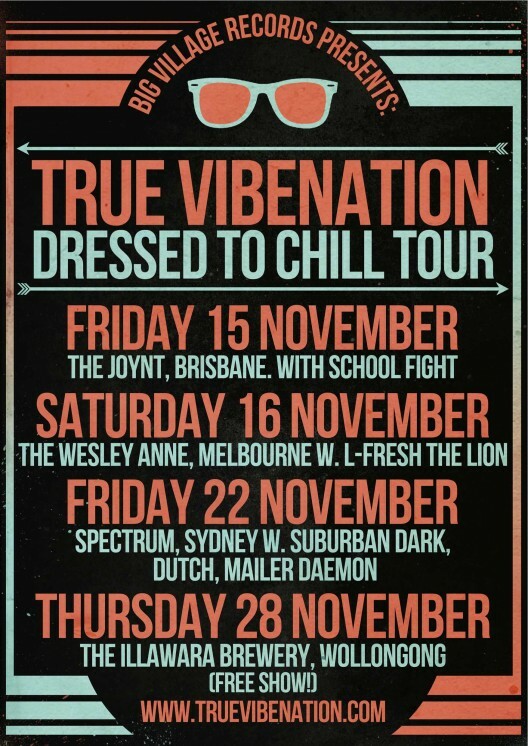 On the back of the album’s success and reputation for their live performance, True Vibenation sold out their album launch at Sydney’s iconic Annandale Hotel and have been touring incessantly, wowing audiences with their infectious energy and killer live show. 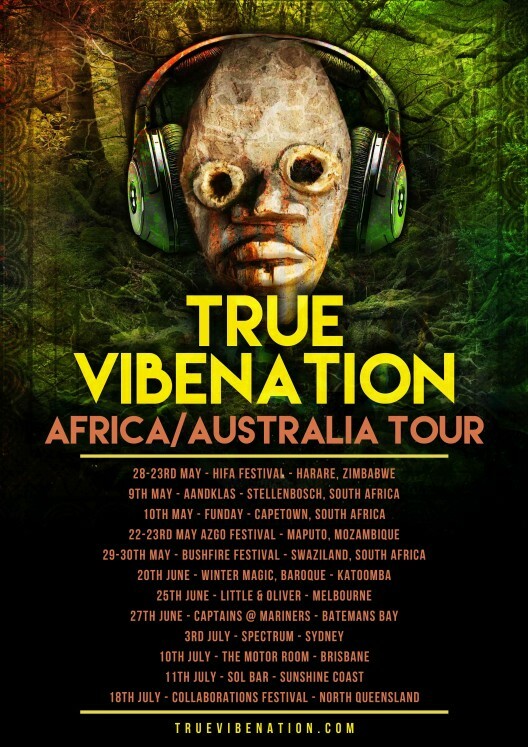 After the album’s drop True Vibenation lapped the country on their own headline tour before touring with the Big Village crew, playing Sydney Festival and Subsonic Festival and earning support slots with the likes of Chali 2na, Dead Prez, and Antibalas. With an ever-growing fan base, tight live show and a penchant for hard work True Vibenation are a group with a bright future in Australia’s evolving hip hop landscape. True Vibenation are back from Africa and straight back on the grind! 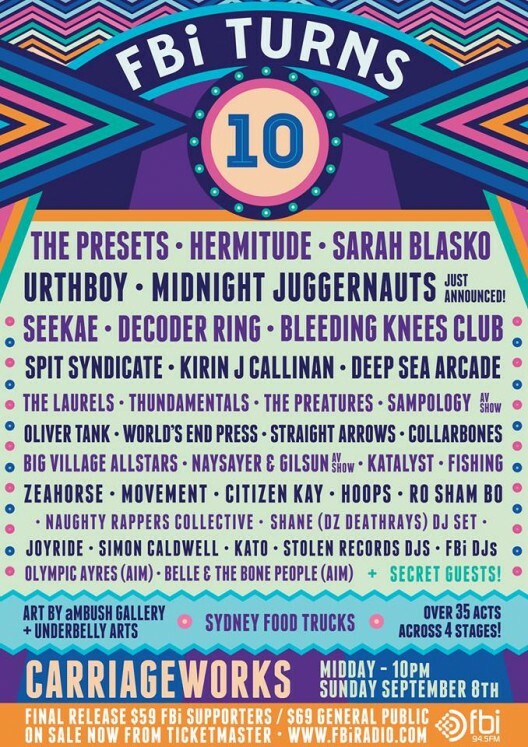 On Sunday September 8 we’ll be performing a very special show with the Big Village Allstars alongside some stellar names including The Presets, Hermitude, Urthboy and the Midnight Juggernauts. Get your tickets soon, it’s going to be LARGE.